Closets are notorious for being messy and hard to maintain. But creating a clean and organized space is not as hard as it seems. The key is to have a place for everything, and everything in its place. 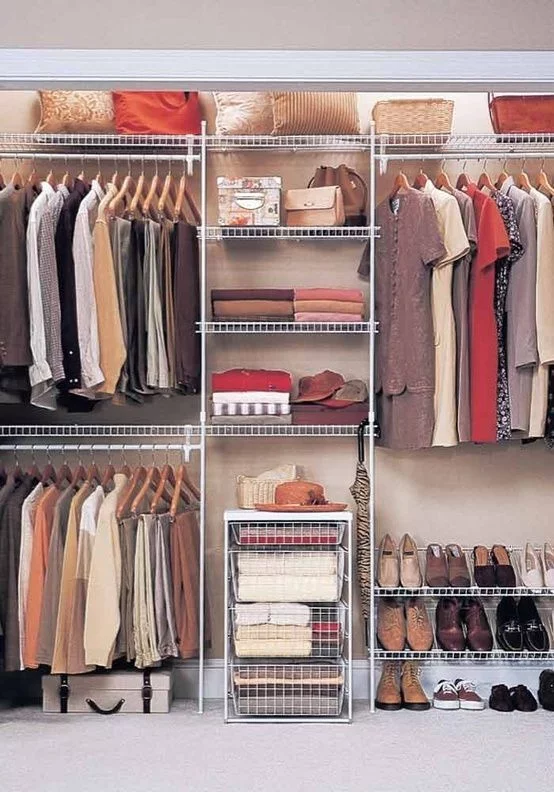 With these 10 tips, you will have a clutter-free closet in no time. The best way to start tackling your messy closet is to take everything out. Yes, everything. This will give you a chance to physically clean your closet as well as re-assess the space you have. With everything out of the closet, now is time to sort what you have. Chances are, there are clothes in your closet that haven’t been worn in years. Create designated boxes or piles for “keep,” “donate,” and “trash.” If you are having a hard time with this step, ask yourself questions like; “Have I worn it in the last year?” or “If my home burned down and I lost everything, would I replace this?” This is also an excellent time to get rid of any socks without a mate, or any clothes that are stained or have holes. One of the reasons closets get so cluttered in the first place is that we tend to throw things in there that don’t belong. 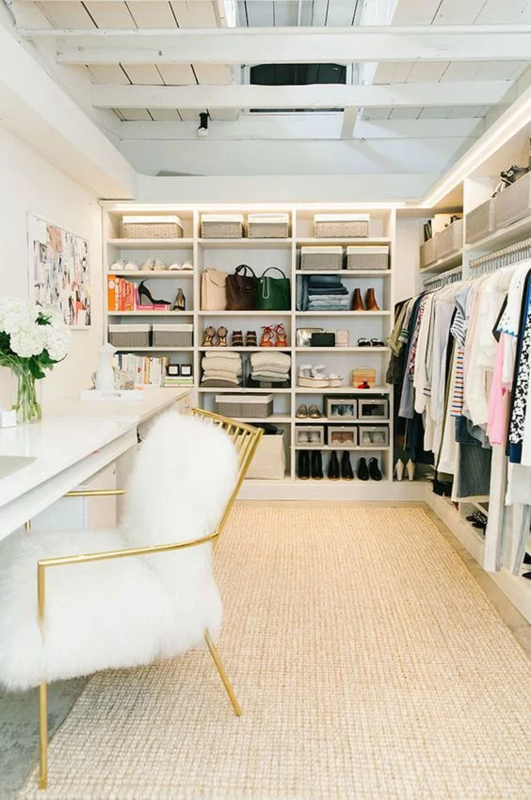 A closet is a place for clothes, shoes, and accessories. It is not the place for old bank statements and insurance information. 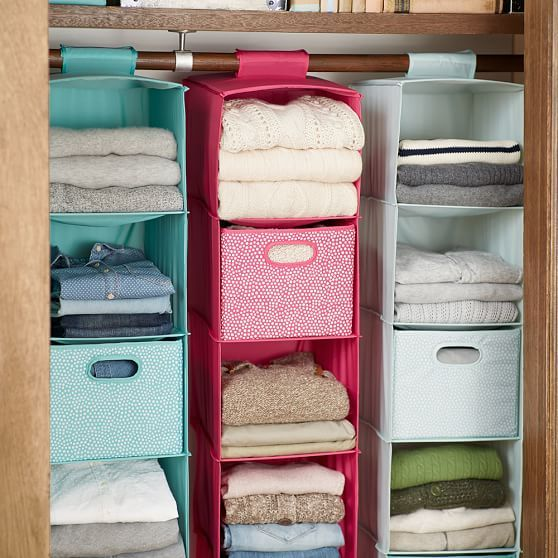 Keeping odds and ends out of your closet will help it from becoming a general storage place. 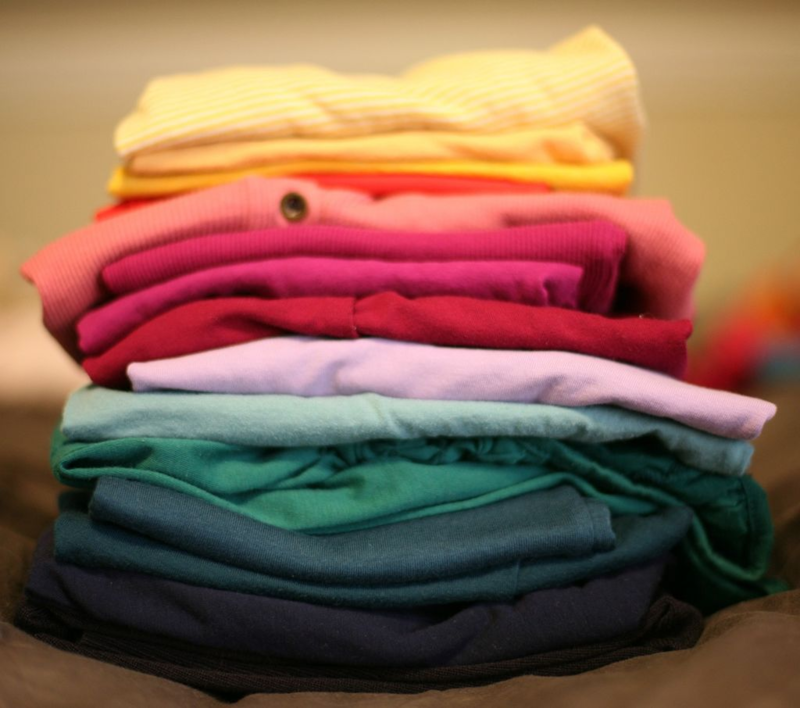 Designate your clothes into groups, and then think about how you want to arrange those groups in your closet. For example, you could hang all your shirts together, pants together, dresses, etc. This makes it easy to find whatever piece of clothing you are looking for. Similarly, an occasion-based organization method is excellent for working professionals. Keep your work/office clothes together, and your casual/weekend clothes in another section, and special occasion clothes somewhere else. You could also take a seasonal approach. Do you want all of you winter clothes in one place and summer clothes in another? If you have a smaller closet, this approach might be best, so that you can store half of your clothes away when they’re not needed. 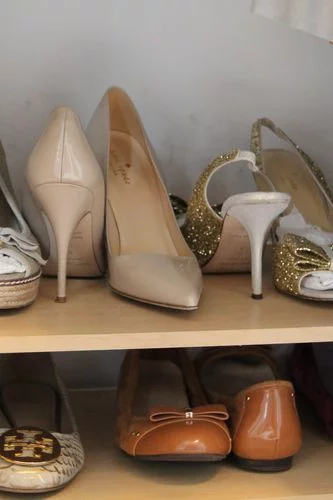 Shoes tend to be a bit bulky and hard to store. Rather than just throwing them in a pile, designate a separate space for them in your closet. If you don’t have many shoes, wicker baskets are a visually-appealing yet straightforward way to store them. If you have a closet door, an over-the-door shoe organizer will do the trick. For those of you with shelves, save space by staggering your shoes. Arrange them so one shoe has the toe facing forward, and its mate has the heel facing forward. Some hangers can be broad, which takes up more closet space. Opt for space-saving hangers instead. Cascade hangers let you hang multiple hangers vertically, saving on horizontal space. Thin wire hangers will allow you to hang more clothes on the same rod. Increase your hanging space by adding another rod. This will make your closet “double-layered” in some places. Use this area to hang shorter clothes like shirts and jackets. Leave a place with a single rod for the longer items like dresses, so that nothing is underneath them. Bulky clothing like jackets and sweaters can be a challenge. Winter jackets take up a lot of space and aren’t used all year, so keep them in a separate coat closet somewhere in the house. Then, get creative with how you store your sweaters. Use a hanging shoe organizer and roll them up in each of the sections. Or, fold them and keep them on a shelf. Shelf dividers will help with organization, and keep the stacks from falling over. Many times, a closet does not reach its full potential because it is poorly lit. Dark corners of the closet are harder to keep organized, and fall victim to discarded clutter. Prevent this from happening by adding a fun and functional light source. A brightly-lit closet will look nicer, and can even give it a boutique-y feel. 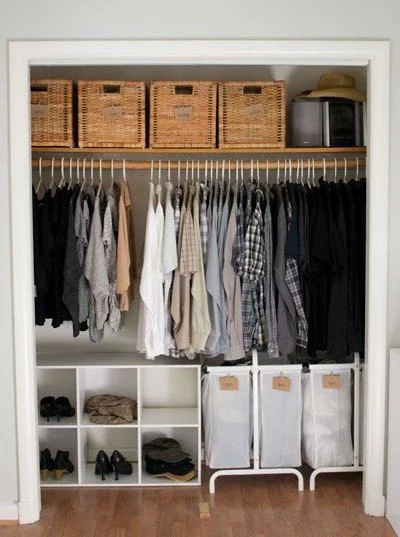 Once you’ve sorted and re-organized your closet, keep it going! It’s easier to maintain a clean closet when you do it consistently. Turn all of your hangers backwards, and whenever you wear something, hang it back up with the hanger facing forward. This will help you keep track of what you have and haven’t worn. Keep a basket in the closet for items you want to discard over time, so you can purge your closet as you go. You can also use the “one in, one out” rule. Whenever you go shopping and buy something new, you have to get rid of something old. Sometimes you have to be a little strict with yourself, but you will be able to keep a beautifully organized closet as a result.